Newest Technology at The Electric Alternative. a. First 1000 customers each day b. Last 1000 customers each day c. Anyone over 18 d. Hint: You, if you'd like to try anything new and different. Did you know that all of our e-liquid ingredients are made here in the USA ? a. Good, I like to buy American b. I'm guessing that helps on monitoring the contents and ingredients. c. Nice to know! 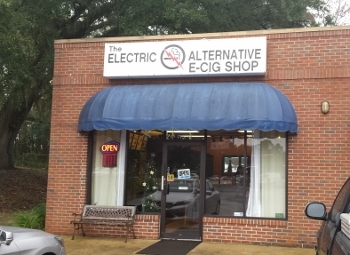 Did you know that The Electric Alternative carries all name brand products (no knock offs!) ? a. Too bad I love to buy inferior products. b. Guess when you've been in the biz for the longest you have perfected the service. Is it true that we Vape test new customers to find correct nicotine mg according to our customers smoking habits. a. Not a no here. b. 10-4 would probably cover it. c. Yep, helps you ditch the cigarettes faster I bet. d. Only the the first 1000 customers daily! True or False; We supply high quality replacement coils at affordable prices.